World Toilet Day was celebrated on Twitter by the Loma Linda University School of Public Health. The Public Health Core (PCOR) class used a Team Based Learning (TBL) strategy to learn about global health issues while simultaneously identifying publicly available toilets that could be accessed by the large homeless population in San Bernardino. Students tweeted their pictures of toilets and descriptions using the #LLUtoilet and #worldtoiletday hashtags. The two hashtags allowed their tweets about San Bernardino to show up on the twitter timeline with other tweets from global agencies such as UNICEF and the WHO. Students communicated with others about a global health situation that occurs locally, but globally relevant. The effect was a virtual “Flashmob” where LLU SPH students dominated the twitter hashtag #worldtoiletday for Nov 17th. That brings publicity to the LLU SPH and addresses an increasingly important global health issue. The toilets were also crowdsourced on the washspot.crowdmap.com website that allows interested parties to find toilets that are available for the homeless. 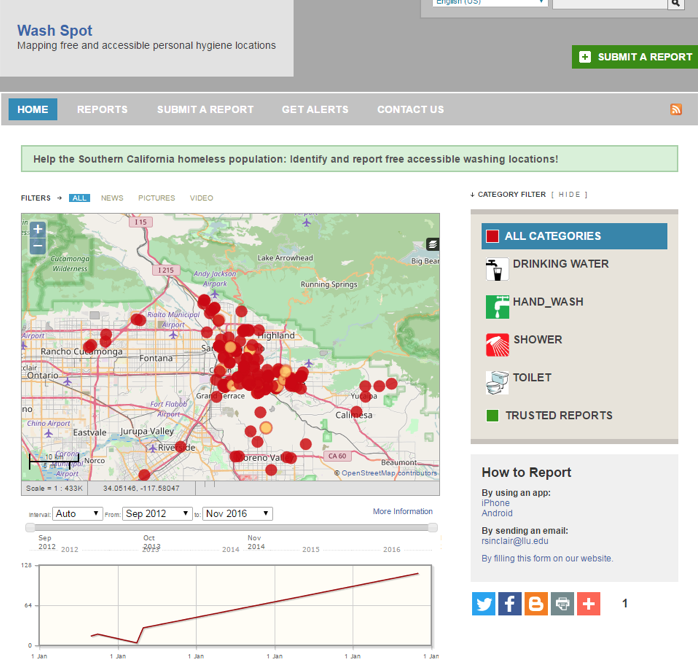 The crowdmap website contains details about access issues with these toilets that would be relevant for charity organizations or city planners who need to rapidly accommodate the homeless populations while addressing a potential public health hazard.